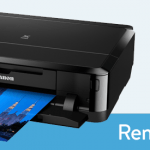 If you right click on a printer and delete it, this doesn’t remove the printer driver from the machine. Sometimes when working with print servers and testing multiple drivers there will be times when you need to completely remove a driver package from the machine so you can install a new or different one. Windows Vista and Windows 7 has a tool called the Microsoft Management Console (MMC) built into windows which you will use to remove the drivers. Please note, if you are running the premium or home version of the OS then skip to the bottom and follow the alternative option. Reboot the machine and login as “Administrator”. Go to the start menu and start typing MMC, you will see the Microsoft Management Console shortcut appear in the start menu; click on it. 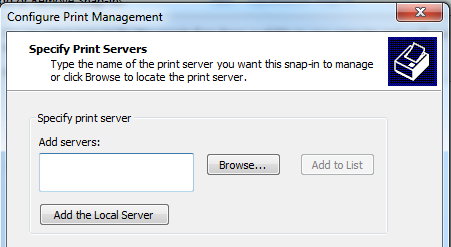 Then scroll down in the list and select the “Print Management” snap-in and then hit “Add”. At this screen you are going to want to select “Add the Local Server”, hit Finish, and then hit ok.
Then you can scroll down to your computer name, select the drivers tree and then right click on the driver you want to remove and select “Remove Driver Package”. Make sure you reboot your machine before trying to add new or different print drivers. 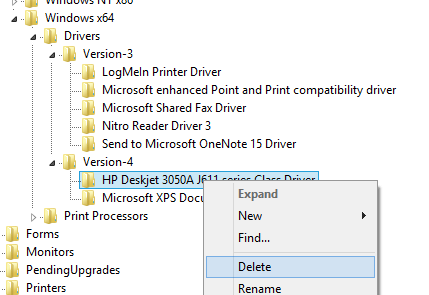 Alternative way to remove the printer driver. 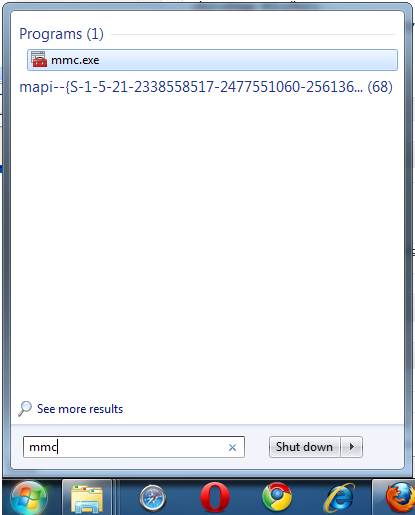 For those of you running Windows 7 Home or Premium then you might not have the MMC options available. This is an alternative way to remove the printer driver. 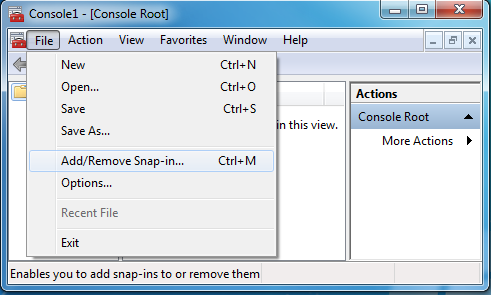 Go to your start menu, search for “regedit” and click into it. You now might have two different folders, Version-3 and Version-4. 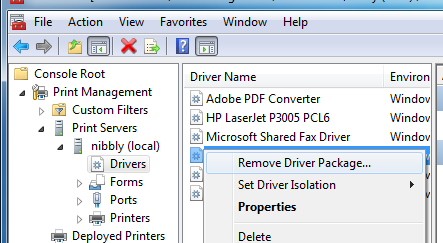 Simply expand those folders and find your printer driver that you are trying to remove. Then right click on the printer folder and select “Delete.” Reboot your computer and you should be good to go. 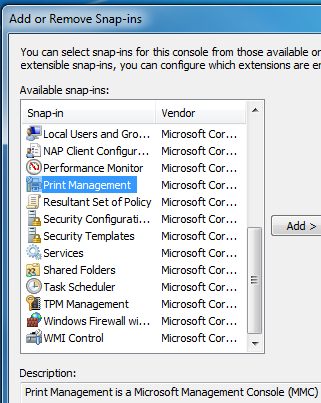 Print Management snap in not available on Windows 7 Home Premium. Any other way to do it? Thanks Very much for Sugesstions….!! Its really usefull……. Can’t seem to do this with Windows 7 Enterprise edition if there are users who have added printers that use those drivers? I just get an error message that I cannot remove the driver. I hate re-imaging computers for something so silly as a corrupted print driver. I can access the mmc in Home Premium but I can’t see the printer management, I also tried safe mode, but still nothing. Any suggestions? You can actually “remove” corrupted print drivers that won’t uninstall for whatever reason by deleting the registry key for them. This trick works regardless of version, so it will work on Enterprise as well as Home Premium. To “remove” the driver, just delete the key for the driver that is giving you issues. When you re-install the driver, it will think that the driver is not installed and will overwrite everything cleanly. Thanks for the tip. I had a problem with it saying that the driver was in use. So i went to each driver and checked out what was printing and cancelled the current print jobs in the queue. After that worked like a charm. Thanks a ton. When I try to remove the package it says, “Failed to remove driver Xerox Global Print Driver PS. The specified printer driver is currently in use. @Sarah: Make sure you restart your computer first and log in as Administrator. Open a Console Terminal (run CMD. exe) as administrator. type Net Stop Spooler. This stop all spooling process and free the resources. 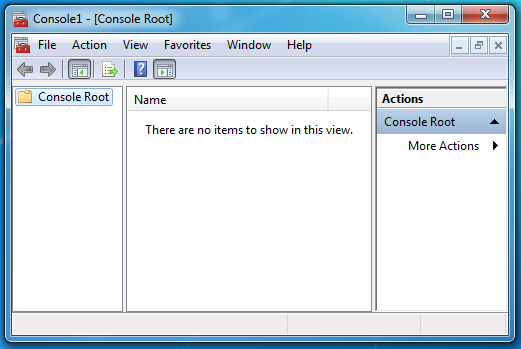 You can also launch the MMC from the console, this will allow you to run as admin without having to reboot. Great tip Luc0065. Thanks for posting. This works only a bit. For at least 2 of the printer drivers, the console reports that the printer driver is in use, and this is after rebooting. So console refuses to remove the driver packages. How do I stop/cancel these phantom jobs? Or how do I force the add in to do what it says on the tin? I have been trying to remove print drivers in Windows 7 Home Premium unsuccessfully. Tried your alternative method since everything I have tried failed. Your alternative method also failed. I believe the driver is being reinstalled somehow…..similar to some of the malware I encountered. Any suggestions?? Is your malware installing the printer driver. Sometimes coupon printing malwares can install fake printers. Have you tried running malwarebytes? Thank you! Your solution worked, but only after I saw that the “printer” (HP Fax printer) in question had a couple of documents in it’s que. After i convinced it to cancel those jobs, it successfully deleted and I was able to go back and delete the drivers. I’m guessing those stuck documents were preventing it from being deleted. Lesson learned, and new ways to access stubborn programs learned. The alternative method works but does require the printer queue to be empty. Thankyou bro the alternative solution works wonder….